The L.O.C. 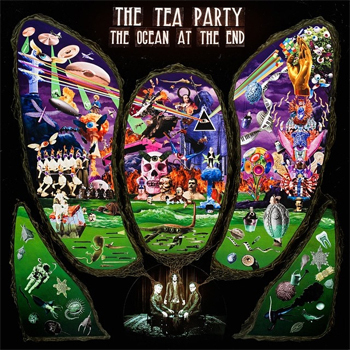 starts things off with an instantly almost recognisable Tea Party sound, and you can’t argue with me when I say that they have a distinct sound, because well, you’d lose. This sets up the album with that middle eastern sounding guitar we all know so well, and you think that sounded like The Tea Party of old, well check out ‘The Black Sea’ a song absolutely perfectly suited to Jeff Martin’s deep and brooding voice, with the music darker and a great melody and arrangement throughout it, it’s no wonder it’s a single lifted from the album. I can’t wait to hear hoe heavy this becomes in a live environment. ‘Cypher’ and its minute long intro sets up this one with its almost hooky chorus and it allows Jeff to get into the song both vocally and with some psychedelic guitar work throughout. Now the track I was most intrigued by on the album is a song called ‘The Maker’, which is a song written by Daniel Lanois, who also wrote ‘The Messenger’ which you may know from The Tea Party also, but ‘The Maker’ is a song that Jeff has been performing for some time in his solo shows, so when the opportunity arose, well I’m glad it was considered and made it onto the album. I really like this incarnation of the song, it’s not heavy, not dark, it’s just so well produced and is such a great song, so I for one am very happy with this. What I am also happy with is hearing a twelve string guitar strummed to open ‘Black Roses’ as it just sounds perfect, this one is a simple rocker with so many layers that if you listen closely there is so much going on and it is so well mixed that nothing overpowers anything else and again shows the mastery of this band. I love the outro to this one as Jeff emotes the lyrics and as it fades out, you wouldn’t pick that was a five and a half minute song as it was enjoyable and worked. In having the album for quite some time now, this next one ‘Brazil’ is the one that has taken me some time to get into, even with the cool guitar riff throughout, I think maybe I need to sit with this one a little while longer, leave it with me… As we reach ‘The 11th Hour’, now we’re talking, this is one groovy track, I really dig what they’ve done here with this one, it has a slinkiness to it and I love the breakdown into the chorus here as it slows but then picks right back up. This one works for me, so very much and again, in terms of arrangements here this is second to none. Oh hello ‘Submission’ which sounds like it picks up right where ‘Temptation’ left off and THAT is a good thing, oh man, this one is killer, it’s almost industrial at times but is a song only The Tea Party could make, this one is a standout that’s for sure, and this late in the album is a nice little surprise. Whoa, um, ‘The Cass Corridor’ clocking in at under three minutes is short, sharp and wants us to kick out the jams in what feels like a rocked up blues, punk, rockabilly style song, very confusing but hard to dislike, as it doesn’t really fit in with the rest of the album, but it’s placed well as it leads into the single lifted from the album ‘Water’s On Fire’ which is hands down my favourite song on the album, of course this is coming from the guy who loves a good ballad and who’s favourite Tea Party song is ‘Heaven Coming Down’ so when I heard this, I was instantly into it. The way that the verses maintain a level to then elevate to the chorus makes me very happy, and I can’t wait to hear it next month when I’m sure it will be belted out on stage. Winner!! OK, the tile track, it’s eight and a half minutes long… I’m intrigued from the get go, but it is The Tea Party so I really shouldn’t be that intrigued as much as I should expect this kind of thing. While it does take a good amount of time for the song to start after its hauntingly beautiful intro, that etherealness is maintained throughout the song with an almost hypnotic beat to it which completely draws you into it and that is amazing. What is also amazing is the two minute guitar solo that appears mid song, with a perfect tone on it, it cuts through that haunting music as mentioned above and as it fades the song takes a turn into its last two minutes and is almost a different song, but I absolutely love it. It’s beyond worthy of the naming rights of the album and will probably turn into a fifteen minute version when they play it live.